There are nearly 90,000 homeless people live in Los Angeles County but only 9,000 to 10,000 beds available in homeless shelters, single-room occupancy hotels, and other facilities. Across the United States, many local governments are responding to skyrocketing levels of inequality and the now decades-long crisis of homelessness among the very poor … by passing laws making it a crime to sleep in a parked car. Their hope, of course, is that homeless people will go elsewhere, despite the fact that the great majority of homeless people are trying to survive in the same communities in which they were last housed – and where they still maintain connections. Americans sleeping in their own cars literally have nowhere to go. Indeed, nearly all homelessness in the US begins with a loss of income and an eviction for nonpayment of rent – a rent set entirely by market forces. The waiting lists are years long for the tiny fraction of housing with government subsidies. And rents have risen dramatically in the past two years, in part because long-time tenants must now compete with the millions of former homeowners who lost their homes in the Great Recession. The paths from eviction to homelessness follow familiar patterns. For the completely destitute without family or friends able to help, that path leads more or less directly to the streets. For those slightly better off, unemployment and the exhaustion of meager savings – along with the good graces of family and friends – eventually leaves people with only two alternatives: a shelter cot or their old automobile. However, in places like Los Angeles, the shelters are pretty much always full. 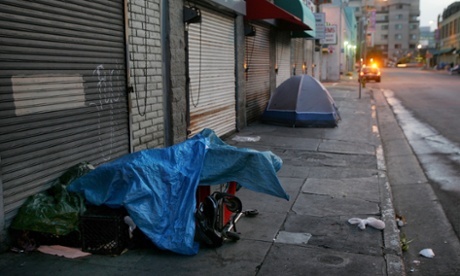 Between 2011 and 2013, the number of unsheltered homeless people increased by 67%. In Palo Alto last year, there were 12 shelter beds for 157 homeless individuals. Homeless people in these cities do have choices: they can choose to sleep in a doorway, on a sidewalk, in a park, under a bridge or overpass, or – if they are relatively lucky – in a car. But these cities have ordinances that make all of those choices a criminal offense. The car is the best of bad options, now common enough that local bureaucrats have devised a new, if oxymoronic, term – the “vehicularly housed”. People sleeping in cars try to find legal, nighttime parking places, where they will be less apparent and arouse the least hostility. But cities like Palo Alto and Los Angeles often forbid parking between 2am and 5am in commercial areas, where police write expensive tickets and arrest and impound the vehicles of repeat offenders. That leaves residential areas, where overnight street parking cannot, as a practical matter, be prohibited. One finds the “vehicularly housed” in virtually every neighborhood, including my own. But the animus that drives anti-homeless laws seems to be greatest in the wealthiest cities, like Palo Alto, which has probably spawned more per-capita fortunes than any city on Earth, and in the more recently gentrified areas like Los Angeles’ Venice. These places are ruled by majorities of “liberals” who decry, with increasing fervor, the rapid rise in economic inequality. Nationally, 90% of Democrats (and 45% of Republicans) believe the government should act to reduce the rich-poor gap. It is easy to be opposed to inequality in the abstract. So why are Los Angeles and Palo Alto spending virtually none of their budgets on efforts to provide housing for the very poor and homeless? When the most obvious evidence of inequality parks on their street, it appears, even liberals would rather just call the police. The word from the car: if you’re not going to do anything to help, please don’t make things worse.